Lucky John MEBARU is a balanced jig especially designed for angling of predatory fish from the ice or vertically from a boat. The lure has sufficient weight, therefore its effective for angling of fish at great depths, on rivers with low current or from a drifting boat. It ensures accurate and stable play at any depth. 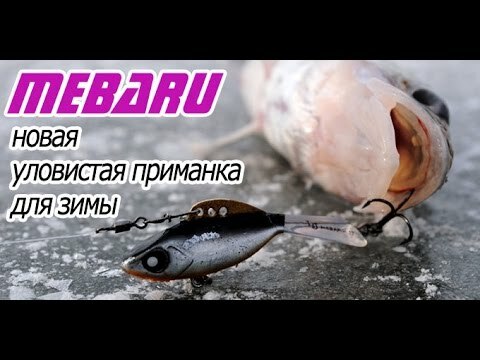 When angling with Lucky John Mebaru, the technique used is similar to the one used when angling with balancers or spoon-baits. It is recommended to take a pause of one or more seconds between the drops of the lure, depending on the activity of predatory fish. The structure is a single cast made from frost-resistant ABS Plastic. A long tail is highly durable and ensures precise turns of the lure in the extreme points of the trajectory of its movement. During the pause, the lure returns to its initial point always head first, which does not alarm the predatory fish, but rather attracts it even more. Its spinal fin made of brass has three holes. The play of the MEBARU lure will differ depending on the hole to which the fastener is attached. 1. Fixture of the lure by the middle hole. In this case, its play is wider – the fishing area is the greatest and the lure moves away from the centre for the maximum distance. In case of such fixture, the lure creates maximum fluctuations of water and become more noticeable for predatory fish while staying at a distance of several metres from it. Recommended for fishing at great depths, in places where there are no snags or aquatic vegetation, as well as during the period when the first ice appears. 2. Fixture of the lure by the front hole. When moving, the lure has the greatest vertical component and more aggressive play. Recommended for angling when the search of fish is carried out by orderly fishing out different depths. 3. Fixture of the lure by the rear hole. When angling the fish using this fixture of the lure, its play is calmer and the area of fishing is slightly smaller. A highly effective method when angling in the dead of winter and in places with snagged bottom or aquatic vegetation. Special “bloody” series of colours distinguish this lure from other lures with tedious colours, thus promoting fast and effective attack on the fish. 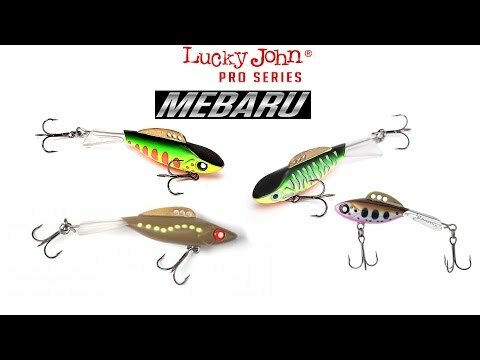 Lucky John Mebaru lure is equipped with two high-quality Japanese hooks OWNER. Recommended for angling of perch, zander, pike and trout. Mebaru is developed in Japan.